Web sites change, and the CaneSIG site is being reorganised again for easier access to resources and to simplify maintenance. Please let me know about any problems and I'll try to correct them as soon as possible. Please be very explicit with urls and other details, and include "CaneSIG" in your e-mail subject heading, when reporting problems. Individual's modelling interests change over time and I'm no exception. I've primarily been exploring the use of photorealistic card modelling for structures and rolling stock. This has resulted in building more "QR and Queensland shire than sugar cane models but cane remains my major interest. My Capricorn Sugar Rail Museum display layout continues to undergo changes, albeit very slowly due to changing family circumstances, and my modelling results will be there and/or in the Narrow Gauge Downunder magazine. CaneSIG is a free resource for modellers of the world's sugar cane railways. While it is affiliated with the NMRA as a Special Interest Group (SIG), membership is not required to participate or download resources. Mainline is the bi-monthly magazine of the NMRA's Australasian Region. Materials have been provided by modellers and enthusiasts for the personal use of other modellers only. Please do not abuse this privilege; contact the copyright holders for any other use. Please contact the Coordinator if you have resources that you would like to share and become a 'member'. 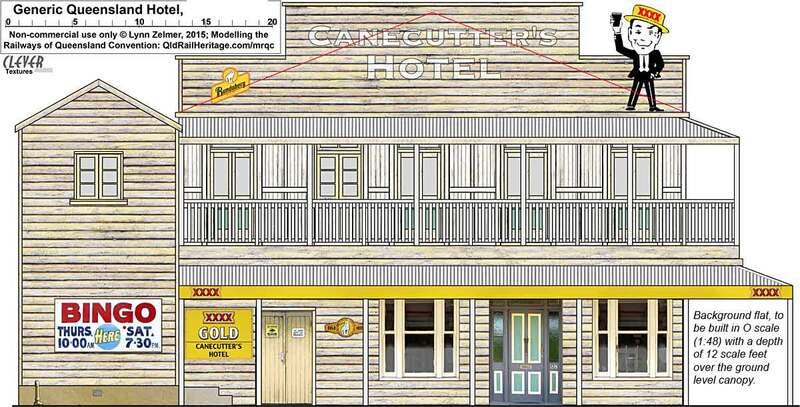 Introduction to Cane Railway Modelling (25 page pdf file with 2008 convention presentation notes); Modelling Handbooks (How to' tips for modelling Queensland's cane railways, pdf files). Gallery of N, HO, S & O scale and Large/Garden sugar cane railway models. Narrow Gauge DownUnder magazine articles relevant to sugar cane railways (some as pdf downloads). Australian Sugar Mills: current and closed mills, etc. Includes over 11,000 images, plans, etc., of Australian and overseas railway locomotives, wagons, buildings, scenes/locales, etc. ; with an emphasis on images related to sugar cane or Queensland's rail heritage. Organisations: ATRQ (Association of Tourist Railways Queensland), LRRSA (Light Railway Research Society of Australia). Australian Magazines: AMRM (Australian Model Railway Magazine), Narrow Gauge Down Under and Light Railways (LRRSA). Heritage Railways/Museums: ASCR (Australian Sugar Cane Railway, Bundaberg), ANGRMS (Australian Narrow Gauge Railway Museum Society Woodford), ILRMS (Illawarra Light Railway Museum Society, NSW), and ASIM (Australian Sugar Industry Museum, Mourilyan, Qld). Selected listing of YouTube Video Resources: Queensland railways and tramlines, sugar cane in Australia and overseas, narrow gauge. Be Aware during the cane crushing season - usually May to November each year (in Queensland). Look out for flashing lights positioned at level crossings on major roads. Become familiar with cane train crossings in your area, recognize the signs and be aware of crossings on less major roads that do not have flashing lights. Don't race a cane train. Educate your children to stay away from cane rail tracks and cane trains. last updated: 29 July 2016.